Coppell High School sophomore Sydney De León obtains being true to herself in the green room backstage during Karen Ruth’s third period Broadway Bound class on Jan. 11. De León feels composure due to that being in the safe spot prior to a show or any acting activity. 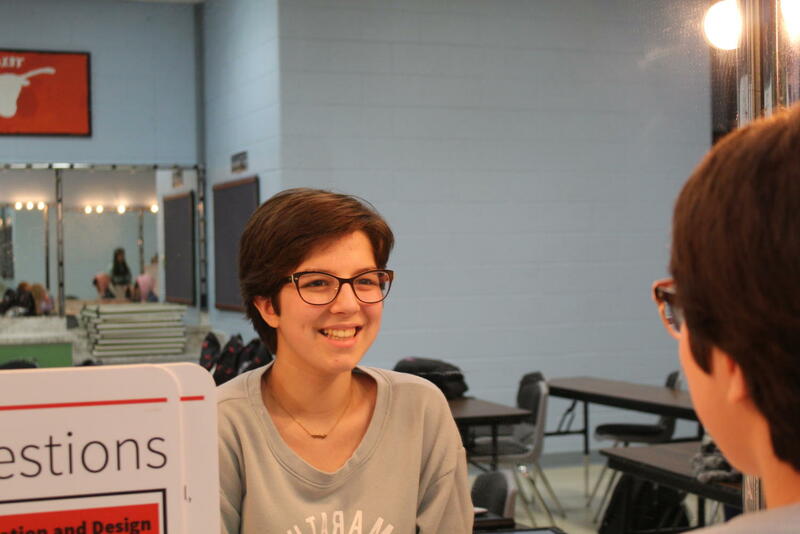 Sydney de León is a sophomore at Coppell High School and budding amateur in the world of theater. However, she is only an amateur by definition. Her name has been plastered on playbills left and right. Once a production wraps up, she quickly finds another to be involved in. De León actively ignores her limits. Her story starts in Dallas as a middle child to eight siblings. It is a lifestyle not commonly found, but for de León it is far from a hindrance. A strong sense of camaraderie runs through her siblings even though their ages range from 1 to 39. It was her family who initially promoted the idea of theater to de León. Her mom’s intention was to get Sydney out of the house and do something she was interested in; it just so happens that the young third grader had her eyes set on theater. Thus she was enrolled in a drama class. The support she has received from friends and family has allowed de León to continue pursuing her passion. Her mother, Dawn de León Parry, has undoubtedly provided the biggest motivation since the day de León first set foot on stage. Years after her third grade performances, the Coppell Middle School East theater program, spearheaded by the eccentric Amy Yakubovsky, cemented de León’s love for the art. Being under the spotlights of East’s cafetorium helped de León understand the many responsibilities actors carry. After middle school, de León joined the theater program at CHS. De León’s freshman year was a period of adjusting to the CHS theater department. However, her passion would soon reach higher limits as she entered sophomore year. Under the tutelage of CHS theater department director Karen Ruth, de León flexed her artistic muscle harder in 2018. She starred in the CHS production of “All Shook Up” in October and November as an ensemble member. Dallas-Fort Worth is a bubbling hot spot for the arts, and theater is no exception. In high school, de León began to participate in theater productions outside of school. Recently she has performed in theaters such as the Ohlook Performing Arts Center in Grapevine. Masterclasses are a form of theater education which combine elements of dancing, singing and acting to strengthen theatrical ability within young and experienced thespians. De León was given the chance by Ohlook to take part of a masterclass with Jay Armstrong Johnson, a notable American actor, in its audience. Such an experience like that is a major step forward for any artist. It justifies the hard work and passion poured into every role landed. To this day, de León has been a part of 10 musicals and seven plays. To this day, de León has only broken one wrist while on stage. De León’s aspirations reach higher altitudes every time she steps foot on stage. She knows every time she lands a role or hits a perfect note, her ambition will only increase. It is the undying passion for theater present in her which is worthy of a play in and of itself. This story was originally published on Coppell Student Media on January 14, 2019.